ARTnTHAT: 100th day of Daily Photo!!!!! 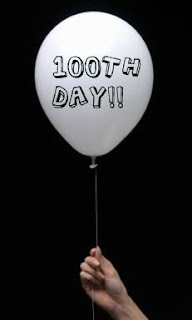 That's my Daily Photo reached its 100th Day!!! Can't believe it! This project started with me deciding to take an artistic photograph everyday once I had finished Art School for Summer and as a sort of personal project. Since you see something inspiring at least once a day (and when I didn't it made me look for something )and think "oh that would be good to use for a project," or "thats really unusual/strange" it began a visual diary of daily life. Now I've certainly began to notice things I've never noticed before, after a while we become oblivious to the things around us...sometimes just by looking up you would be surprised to see something you have never noticed before. I was then surprised to get followers and then being reblogged across the globe, in blogs in New York, London etc... oh so exciting....to think others appreciate your work and are interested. Would like to say thanks again to all my followers! Take a trip to visit my Daily Photograph.